Have you read any of those tongue in cheek books on how to survive the coming zombie apocalypse? They’re funny in their own way, and reading Chris Steiner’s book it was the first image that popped into my head. I thought i followed automation & computer algorithms closely. Turns out this stuff is touching a *LOT* more industries than I even realized. Not only touching, but altering and changing the landscape of jobs. In many cases supporting & helping folks do their jobs better. In others they’re actually supplanting jobs. The biggest industry that algorithms first touched was wall street. Rewind the clock back to 1980 and enter Thomas Peterffy. He went about applying mathematics to commodities options trading which to that point had been traded on gut instinct. The math won out, and he went on to become a so-called market maker on wall street. The automation & computerization of trading continued at breakneck speed into the 90’s sucking up all the best math & science minds that the Ivy schools could churn out. Enter high frequency trading and you know where this is going. We’ve weathered the near collapse of the financial system in 2008, and endless market shocks at least some of which can be traced back to algorithms. Today a full 60% of the world stock markets are run by high frequency computerized trading. On a related note, check out Eli Pariser’s book The Filter Bubble which talks about search, and how algorithms are crafting and steering what we see and read. Our next stop is a strange one. We meet David Cope who, with a fascinating mix of music & love of writing software, built code to compose music. He then even played it at concerts. He astounded then infuriated critics who couldn’t tell what was composed by a human and what by computer. Some even loved the Cope code generated music more! And after that it just gets stranger. He introduces us to the music industry software that analyzes music for it’s potential to be a hit. Can such software find unknown geniuses? Does it do away with the job of the A&R man? It sure poses some tough questions. If such software can make record companies more profitable, no one will scoff. Next up software touches the art of medicine, and the sacred science of diagnosis. First we’re seeing software that assists doctors, helping find cancers and analyzing symptoms & databases of diagnosis. But what of the day when such software does the job better. It’s already happening. With rising health care costs, improvements in health care diagnostics at lower cost will be a huge boon for the industry. Spotting cancer better & faster? Interested in management & business? Checkout A CTO Must Never Do This a war story about life in the devops trenches. Before astronauts are sent off into space, they are given endless psychological evaluations. They’re asked questions, and probed on and on. Turns out there are a few different psychic groups people fit into, and if you mix the wrong ones, it can be volatile combination. Turns out algorithms and software help NASA evaluate people, and ultimately makes those missions safer by pairing compatible and non-volatile personalities. When in the cramped confines of a spaceship it can be life or death. As criticism, towards the end of the book I felt Steiner lost his way a bit. He spent lots of pages going on about the exodus of engineering, math & science talent to Wall Street, for what he saw as little gain. Whatever your opinions on that may be it didn’t seem to relate to the overall theme and served as a bit of a distraction. As the financial industry has since contracted, he says that problem has subsided and talent has moved back to startups where innovation happens. As he says it’s certainly where the jobs are. Ultimately I would have liked to hear some of his critical thoughts. He brings much to our attention, but doesn’t offer much in the way of caution or alternative ways forward. The problem with healthcare is not with bots taking over. In fact, I think it would be great if we could have bots working on diagnostics. The problem with healthcare costs running away is with the government and the ability of the government to look past the notion of socialism. As soon as the word community or socialism enters into any conversation about healthcare, it gets shot down by those who obviously do not understand the patient’s plight. It is all for profitable gain and as a humanitarian, the life cannot be seen as dollar signs. Some great points Vivian. Thx for the comments. All true the healthcare system has a lot of areas that need improvement. 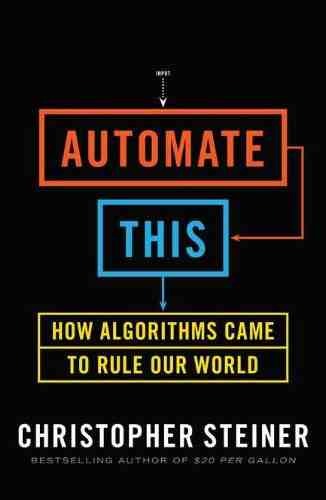 The book itself highlights areas and industries that are being impacted, and where people are being replaced by computers, algorithms and software. So possibly of concern to many.